I heart Open House New York and the Museum of the City of New York. Here we are in the plaza at 140 Broadway. Not pictured is one of my favorite sculptures, Noguchi's Red Cube, and the Harriman Building in the background. Marker reads: "PROPERTY OF 140 BROADWAY CROSSING PERMISSION IS REVOKABLE AT WILL". I love this plaza. A few weeks ago I asked a long time New Yorker about the property markers at the edge of plazas, specifically the ones by Noguchi's Cube in front of 140 Broadway. He didn't know. Answer: Clue 20, a result of the 1961 Zoning Resolution that encouraged construction of broad plazas. You can imagine and appreciate why these plazas are so important to the City. Another favorite spot in New York: 101 Spring Street in SoHo. Clue 21: Where Donald Judd lived and worked when not in Marfa. The neighborhood was originally factories. When artists in the 70s transformed the spaces in to lofts, it wasn't legal. It is permitted because of zoning amendments. Of course, the neighborhood is more international shopping destination than artists' lofts these days, but the zoning amendment helped transform the neighborhood to become what it is today. From there we raced uptown to the Garment District and Times Square. Then hustled from Time Square with a detour towards Rockefeller Center for Clue 15 and then back to 42nd and Fifth to get this shot with the answer just peeking out. Clue 7. Answer: Empire State Building. Stretching it for 2 points with the photo. 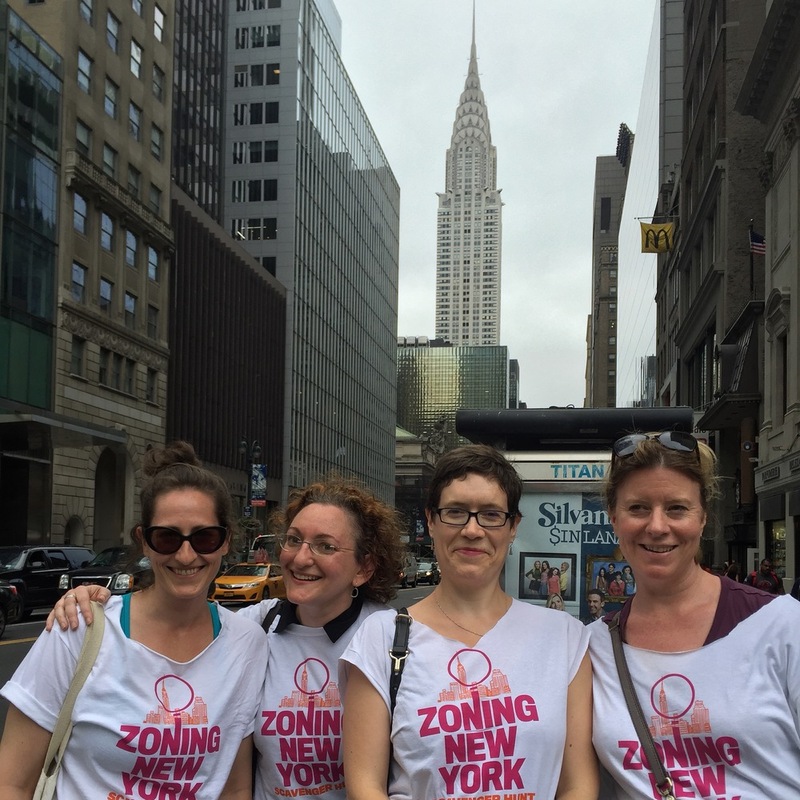 The Empire State Building's iconic form is derivative of 1916 Zoning Resolution. Literally around the corner is Clue 7's Bonus: It has similar interpretation of Zoning Resolution and was the Tallest in the World when completed. From here we hopped in a couple of cabs. We immediately jumped in a cab after this to head north and east with only 15 minutes left. Our cabbie who took us to 375 Park Avenue drove like a real New York Cabbie, weaving in and out of traffic with moxy. He even let us get out to snap our back to back photos in front of Seagram Building and Lever House before jumping back in to arrive at the next location, too far to walk if we were to reach the last 3 clues before 5pm. Clue 13: Seagram Building, 1958, served as model for future office development. Clue 13 Bonus: Lever House, 1952, circumvented existing zoning requirements with 2-story block intersecting tower. With 5 minutes to spare, we uploaded our last photo, Clue 24 (Citigroup Building in Queens, visible from UN Plaza), for 3 points. Afterwards we were all relieved, I think, to be finished. We had to get a picture of our whole group before we headed up to the reception at the Museum of the City of New York. Group photo with our patient photographer along for the ride in front of UN Building. Not sure she knew what she was getting into, but she was wonderful! While we didn't win, we did finish above average and had SO much fun galavanting all over the City (including a ride on the Staten Island Ferry) in our customized t-shirts and learning bits that are so important for the Public to know. Can't wait to see the stats (and the answers)!